Two recent studies by De Ver Group and Spectrum Group polled rich people, defined as those with more than $1 million in liquid assets. They found two things. More than half wished they had put a plan in place earlier. Those who do plan to invest are showing an increased preference for safer, more conservative investments. At Korving & Company, we advise our clients that controlling risk is of paramount importance, whether you are wealthy or just beginning your investment life. If you are rich you want to protect your wealth. If you are just starting, it’s smart to do what rich people do. Plan ahead. We have commented a number of times about the issue of investor psychology and its impact on their actual portfolio returns. On May 24th we wrote: How our emotions hurt our investment decisions. We found another example today. Investors can lose money even when they are invested in the best-performing mutual funds, says the Motley Fool. Their big error? Jumping in and out of a fund in order to attempt to time the market, instead of staying in it for the long haul. It’s a mistake advisors can point to when trying to persuade investors to stay the course. The Motley Fool cites the eye-popping example of the CGM Focus Fund (CGMFX), which was the best-performing mutual fund from 2000 to 2010. Even as the S&P 500 was flat during that period, the fund saw a better than 18% annualized return. But according to Morningstar research, the fund’s average investor lost 11% annually during the period. Many investors jumped in after the fund’s banner 2007 and were burned when it dropped precipitously in 2008. So they left in 2009 and missed another rise. The problem is widespread. Citing a study from Davis Advisors, the Motley Fool says the average stock mutual fund had a 9.9% annualized return from 1991 to 2010, while fund investors saw only 3.8% average returns in the same period. In dollar terms, the average fund investor reaped $21,200 on a $10,000 investment in those years, instead of the $66,300 he could have garnered if he had just stayed the course. Despite overwhelming evidence to the contrary, the popular press continues to tell people that hiring an investment advisor reduces their returns because of the fees an advisor charges. Take a look at the “average investor” in the CGM Focus Fund. If all an advisor had done was held that investor’s hand and told him to stay the course, charging him 1% for the hand-holding that investor would have been better off by 28% per year. This is not an endorsement of this particular fund but simply an illustration that academic studies of theoretical returns based on models have very little to do with the actual results that people have when they invest on their own. The value of professional portfolio construction and management is the implementation of strategies that are suitable for the individual investor in a one-on-one relationship with an investment advisor with the result that much of the emotion is removed from the investment process leading to the greater potential for success. A new report released by FINRA’s Investor Education Foundation shows why, and perhaps casts light on why financial planning has been ranked as one of the best careers.While roughly 75% of Americans have “positive perceptions” of their own financial knowledge and math skills, a meager 14% were able to correctly answer five financial literacy questions compiled by FINRA’s investor education foundation. Advisors point to the dire need for financial literacy classes at US high schools and colleges. I took the quiz and was surprised at how basic it is. Most require no more than basic math or a very rudimentary knowledge of Investing 101. “This survey reveals that many Americans continue to struggle to make ends meet, plan ahead and make sound financial decisions — and that financial literacy levels remain low, especially among our youngest workers. No matter how you slice and dice it, this rich, new dataset underscores the need for us to continue to explore innovative ways to build financial capability among consumers,” says FINRA Foundation Chairman Richard Ketchum in a statement. Please go to the FINRA website and check it out for yourself. There is one other thing going on that bothers me. Keep in mind that only 14% of people who took the quiz were able to answer very, very basic questions about investing. Yet the popular press is constantly telling its readers that all they need to do is put their money in index funds when many people can’t tell you what a mutual fund is. This is like handing a child a pair of scissors and telling him to go run … in traffic. Of course, telling people that they can do-it-yourself by reading their newspaper, magazine or newsletter is a pretty good way of making money on subscriptions, but for most it’s a very poor way of saving for a home, college or retirement. If you took the quiz and failed to get 5 out of 5 right, you need us. We keep running across articles on the subject that we address in our book Before I Go. We don’t want to harp on it, but we will because it’s so important. The death of a parent or spouse is traumatic and having to mine through piles of records, notebooks, mail or a scattering of statements at a time of profound grief is never pleasant. Knowing what mortgage payment to make before a home loan goes into default or even carrying out what should be simple tasks, such as returning a cable box, can be frustratingly thwarted by privacy-minded institutions unless a child has access to a deceased parent’s data, from passwords to powers of attorney to lists of every account in which they have money. Not all families are comfortable having those conversations, however, nor have all parents set up revocable living trusts to simplify the process. We agree, but the idea that having a trust is the answer to these problems is simply not true. A trust or will is necessary, but the details mentioned in the preceding paragraph are rarely mentioned in either the trust or the will. 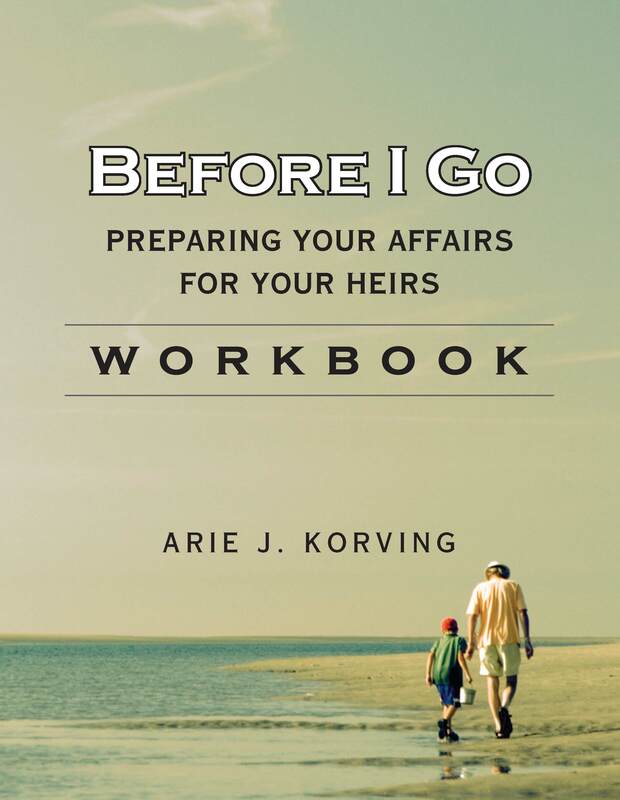 The answer is to fill out the Before I Go Workbook and give your spouse or children some peace of mind after you go. Oftentimes, these women are not actively involved in either the day-to-day management of their household money or the management of their investments. While they may have considerable assets to meet their financial requirements, they’re starting from a handicapped point of view, both from an educational standpoint as well as an emotional one. Get a financial advisor if you don’t already have one. And get a copy or our book: Before I Go by contacting us via our website. They say that there are only two things certain: death and taxes. So it’s inevitable that at some point, one spouse in a marriage will find themselves “suddenly single.” Most people try to avoid thinking about the death of their spouse. But that often means that when it occurs, the spouse left behind is unprepared. Statistics show that men typically pre-decease their wives. Most couples have a division of labor, and traditionally that has involved leaving investment decisions to the husband and the care of the home and children to the wife. What was once a team, where each member had their own role, the surviving spouse now has to do it all. The survivor has lots of decisions to make. These often begin before death and may involve the health care determinations for a spouse unable to make them on his or her own. Funeral decisions come next. In many cases arrangements have been made ahead of time, but there are still details that have to be made unless the deceased has left detailed instructions. Do we know the names of all the friends or acquaintances of the deceased who should be notified? After the funeral, the survivor is faced with a host of financial issues. Assuming the surviving spouse is a widow she is often left with many vital but unanswered questions. How will her income change? We know that the income of the surviving spouse will change. Income from sources such as pensions or social security usually decline. On the other hand, income from other sources like insurance proceeds may go up. Finding the answers is much easier before someone dies. What is needed to maintain her lifestyle? I have seen many instances where the widow did not know how much it took to maintain the home and all the other expenses that continue after a spouse dies. It’s not because she is incompetent, it simply was not her job. The time to make a list of these things is while the couple is still together. Are there insurance policies and where are they? Hundreds of millions in life insurance goes unclaimed each year simply because people don’t know it exists. Life insurance can be a vital resource to keep a family together, especially if the couple is still young. Does the she know where all the family assets are? Whose name are they in and how can they be transferred to her? Many people have investments scattered at various institutions. Too often the spouse left behind doesn’t know where everything is and is left looking at the mail for statements from various investment firms. This can be a serious problem if the accounts are not titled properly or the beneficiary is uncertain. If she has relied on her husband for managing the family finances will she be able to take over? Will age play a factor? Who can you trust to help? Many families take the do-it-yourself approach to managing the family assets. The problem arises if the widow is unprepared to do it herself, leading to confusion and uncertainty. This is also the time when people are vulnerable and can be exploited by unscrupulous advisors. The best time to plan for the transition is while the both husband and wife are still alive and identify an investment professional who can be trusted to manage the family assets in her best interests after he is gone. Who can she talk with to insure she does not run out of money? Over the last quarter century I have been asked to help many people who have lost a spouse. In many cases the grieving spouse did not know the answers to many of the previous questions which caused a great deal of additional anxiety. It does not have to be that way. How our emotions hurt our investment decisions. One of the things that differentiate investing from other financial decisions is bargain hunting. When we buy things in stores, shop for cars or buy homes we have a tendency to look for bargains. We may even negotiate for a lower price. However, studies have shown that when it comes to investing, the more expensive a stock is, the higher the market rises, the more people want to buy. It’s a common saying that the two emotions that most affect the typical investor are greed and fear. Greed makes us buy stocks that have already gone up in price, hoping that we’re jumping on the train that is leaving the station. Fear is what causes us to abandon the market just as it reaches the bottom. Overconfidence – we believe we know more than we really do and believe that the decisions we make are in our best interest. Myopia – we are overly influenced by short term results. However short-term results are often random or dependent on “headline” events that have no long-term meaningful effect. Anchoring – predicting the future from the past. For example, when we look at long term stock market returns we have tendency to project those average returns into the future, ignoring the volatility of the market over the long term. The cat on a hot stove effect – if a cat jumps on a hot stove, he’ll quickly jump off, but he won’t jump on a cold stove either. after investors experience a negative event such as the losses people suffered in 2000 and 2008, they often revert to a strategy that will reduce the probability of reaching their goals by, for example, investing only in CDs or savings accounts. One of the biggest problems investors face today is not lack of information but too much information. Newspapers, magazines, TV and the Internet are bombarding the investor with information and advice: buy this, sell that, top ten funds of last year, cheapest to own, all delivered with intensity and conviction. And many contradicting each other. Investment advisors recognize what biases affect people and provide tremendous value to their clients by understanding and helping reduce their influence. By education and hand-holding when greed or fear are influencing the investing public, they help their clients avoid what Warren Buffet calls their “urges” that get people into trouble. Keep in mind that you are dealing with a financial advisor, not a stock broker. If you can’t tell the difference you’re dealing with the wrong person. Big financial decisions affect your plan, your investments and your future. The role of a financial advisor is to advise you on all the important financial decision you make. As Dave Ramsey is fond of saying: every dollar should have a name. First pay yourself by putting some money aside. If it’s hard , have it done automatically so you don’t have to do it yourself every payday. Poor people are poor for a reason, and that reason is often that they don’t want to take advice. The biggest asset that a young person has it time. They may not have much money but the magic of compounding turns a small amount into a big amount over time. It takes time and patience to get ahead. An advanced degree does not necessarily let you skip rungs on the ladder of success. If you don’t know where you’re money’s going it’s impossible to know where to economize. There are several good computer programs that can help you keep track of where your money is going. It’s the young professional who is most in need of insurance and who is apt to put off getting it until it’s too late. The old school advisor is really a stock jockey who doesn’t bother to listen to your needs but promises to “beat the market.” This person is not an advisor, he just wants to manage your money. Too often people get a lengthy, expensive “financial plan” that projects the future 40, 50 or 60 years out. That’s nonsense and a waste of time and money. Simple plans of a few pages are better and should be reviewed annually and updated with new information. Keep in mid the old saying: the map is not the territory. I can hardly wait for cars that drive themselves. That will come, but in the meantime luxury car makers like Mercedes-Benz are putting more and more gadgets on their top-of-the-line models. There was a time when luxury cars were defined by their sheer size and mass, their power, performance and, of course, exclusive details like leather seats and wood trim. Those factors distinguish the 2014 Mercedes-Benz S-Class, but there’s more to the redefined German flagship that fit the changing nature of the auto industry. From its LED lamps to the 3D cameras, radar and night vision systems that allow the new sedan to virtually drive itself, the new S-Class is a technical tour de force that will likely have competitors racing to catch up…. Mercedes officials noted that it will be the first automobile to dispense with conventional light bulbs, opting instead for more advanced LED technology for everything from the head to taillights, and all those small indicators, reading lamps and mood lights in-between. All told, there are 300 LEDs in the interior alone, 56 in each headlamp and another 25 in each taillight. Oh, and you can choose from seven different colors for the interior lighting, with five dimmer levels and four distinct lighting zones…. There’s the latest version of the Mercedes Distronic technology, using both cameras and radar to monitor the vehicle’s surroundings. It allows the new S-Class to keep pace with traffic, come to a complete stop in a tie-up and then start rolling again. It triggers the brakes if a collision seems likely and even turns on the flashers when one does occur. The latest in lane departure warning systems will even take control if a drowsy driver starts to drift into an adjacent lane. The good news is that these development are finding their way quickly into lower end cars. The Ford Escape, costing less than one-quarter of this Mercedes S-class, will park itself and has adjustable mood lighting. How long can it be before all these high-end goodies will be found in your car?